University Health Network, which runs the hospital, said both the public and staff criticized their installation. The bars that were installed on a vent in front of Toronto General Hospital have been removed. 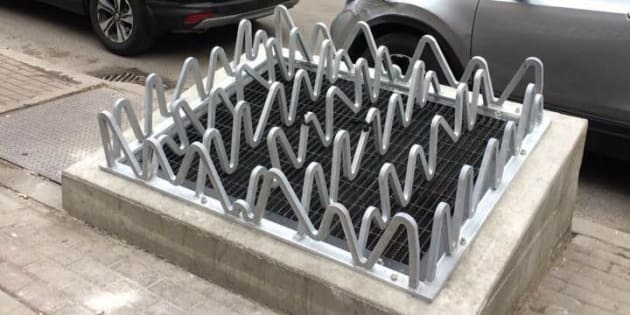 TORONTO — A health organization that runs several hospitals in Toronto has apologized for installing bars over a vent outside a downtown emergency department to deter homeless people from sleeping there. The University Health Network said the bars were installed because the area outside Toronto General Hospital sees significant traffic from cars and ambulances, and because of safety concerns about garbage and needles found in the area. But in trying to solve that problem, the organization said it created the impression that it was not concerned about the needs of the homeless. It has since removed the bars. "I have learned over a long career that when you make a mistake, you step forward, own it and then move on,'' Dr. Charlie Chan, University Health Network's interim president and CEO, said in a statement issued Wednesday. The UHN runs Toronto General Hospital, Toronto Western Hospital and Princess Margaret Hospital, as well as five rehab clinics. The curved grey bars, designed to prevent people from sleeping across the vent, were installed about a week ago and drew considerable backlash from the public and hospital staff, said UHN spokeswoman Gill Howard. "We had a lot of feedback from people within the organization and we certainly don't see ourselves as uncaring or non-compassionate — we're a hospital, we take care of people,'' she said in an interview. Cara Chellew, a Toronto advocate for more inclusive architecture, said the grate was an "obvious example'' of defensive design. Chellew also noted the city has other examples of defensive design, such as public benches with bars in the middle that prevent people from lying down. Meanwhile, Howard said the hospital will still need to address safety concerns in the area, but added that staff will also be looking at more ways to help homeless people.